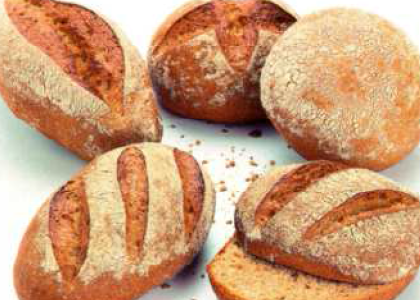 Wholemeal rye, malt flour, wholemeal wheat, soy grits, linseed, dried sour dough, iodised salt, rye flour, sugar, natural spices, guar gum E412, lactic acid E 270, lecithin E 322, soya flour, citric acid E330, sodium diacetate E262, calcium sulphate E516, enzymes (vegetable origin), ascorbic acid E 300. • Proof time: 40 – 50 min. • Baking with steam: rolls at 240° C for 20 min. ; bre ad at 230° C for 30 min.